At Rorke’s Drift on the Buffalo River, Rorke’s Drift Hotel nestles below Shiyane Mountain. The views along and across the river are spectacular and full of interest, and gentle walks in our natural bush surroundings will revive and stimulate. The historic crossing which gives the area its name is within our grounds and of course there is the battlefield, just 5 minutes away, where 11 Victoria Crosses were awarded. The complementary battle of Isandlwana is a 15 minute drive. We are 35mins from Dundee and 20 mins from Nqutu. Our accommodation ‘Fort’ offers 7 double/twin ensuite rooms and we have four single ensuite rooms in the main building – our River Rooms. We also offer a suite at The Deanery, just beside the battlefield for those wishing an even closer encounter with history. 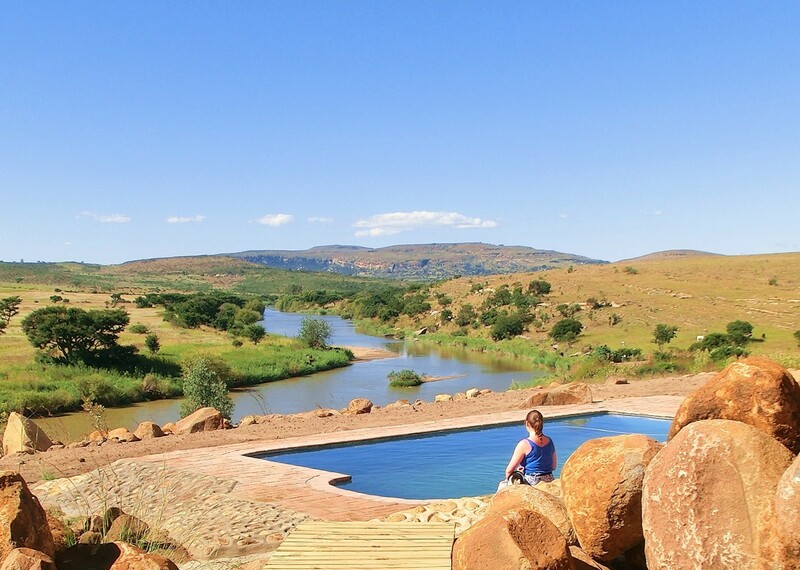 Visitors will be stunned by our position with open views of Zululand towards Isandlwana which are enriched by the history and the stories that you must hear from our deck. We offer a battlefield guiding service for our visitors so you may join a group or have individual attention to meet your wishes. The stunning venue is available for conferences, weddings and special functions. ALL ROADS LEAD TO RORKE’S DRIFT HOTEL . . .
GPS location: 28deg 20′.58S 30deg 32′.38E. The two tar roads on either side of the location are the R33 and the R68 that run South and East from Dundee respectively. Depending on where you are coming from, there are several options to minimise the distance and to have a scenic and enjoyable journey. A: the left turn to Isandlwana indicated; take this road and after 500m you will see the drive to the hotel on your right. 3. From The Central and N Drakensberg head for Ladysmith and through the town (better to pass up Murchison Street; take the first left after crossing the Klip River) and onto the N11 towards Newcastle and then right on the R602 to Glencoe and Dundee. The Dundee route is popular and refer to C above. D - cross the concrete bridge and you will see the Hotel on the left and the drive is 300m up the hill on the left. With less gravel road but slightly longer, go through Nqutu (fuel available) and after 5km take the Left turn indicated St Augustine and follow this gravel road which only has one junction on it where you keep left signed Zakenhi Rd, with the Shiyane mountain in front of you. This road joins the main gravel just above the bridge over the Buffalo (Mzinyathi) River and follow D.
5.2 via the N3 past Estcourt to the exit to Colenso & Bergville. Go through Colenso and after crossing the Tugela River, take the right turn signed to Ezakheni and Newcastle. After the railway bridge the road goes left and past the factory area and eventually will arrive at a Tee junction where you take the Right turn on the Helpmekaar Road. Follow E above. OR you can go through Ladysmith per 3. Please note that there is also a Rorke’s Drift Lodge which is nowhere near the river, and you should look for the HOTEL. TERMS: *Third and subsequent night 25% reduction. Children 12 & under - half price; and specials for family groups. Battlefield visits and excursions are readily available with guides if required. or call 0027 34 6421 760 and cell (++27) 079 0905252 if land lines are down.